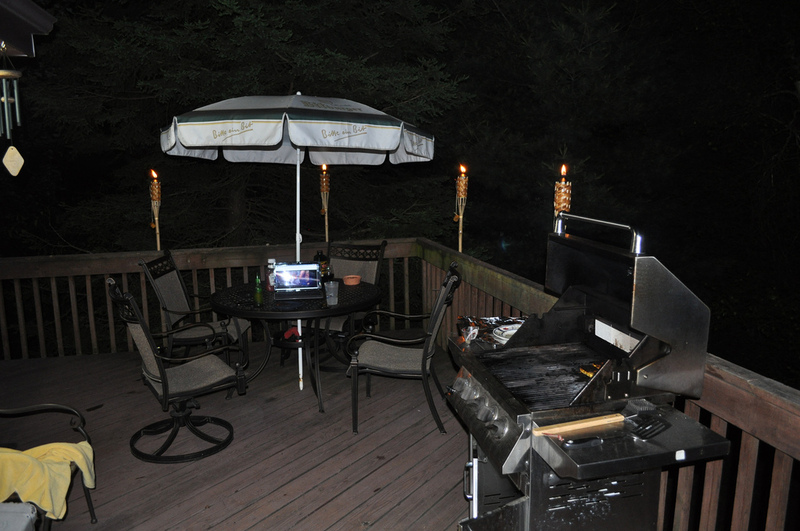 We were about to call it a night when we decided to go out on the deck, fire up the grill, and watch a movie. It’s funny how things work like that. On top of it all we were watching one of the classiest movies of all time: Deuce Bigalow Male Gigolo. We cut up some Hawaiian plantains, basted them with garlic and olive oil, and grilled until just charred. Delicious! It was all fun and games until the lights on the deck started attracting the huge insects. Within 30 minutes we were being surrounded by moths, huge 4-winged beasties, and large flying beetles. At that point it was time to go inside and finish the movie. Tonight’s dinner spawned from my original idea of simple pork chops. While there is nothing wrong with a basic pork chop, the idea just wasn’t sitting well. What could I do with pork that would be a bit different? 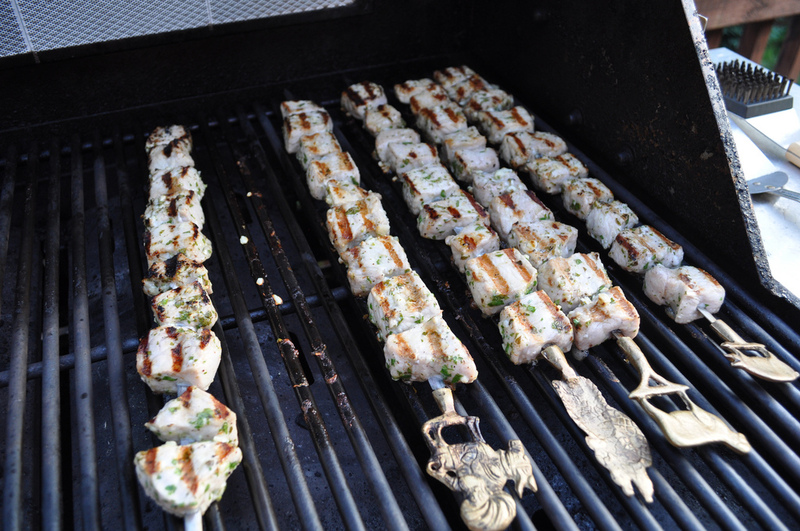 How about one of my Greek favorites, Souvlaki! Place the meat in a large zip-lock bag, add salt, pepper, and parsley. In another bowl, whisk together the remaining ingredients and pour into the bag. Remove air and seal. Let this concoction sit for at least 4 hours for the best flavor. 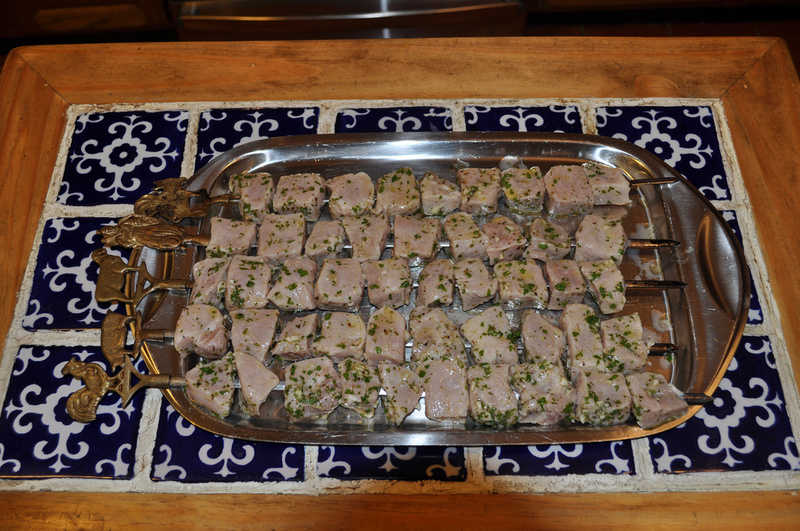 I then threaded them on to 4 large metal skewers and grilled them over high heat; about 4-5 minutes per side. With this I served some diced tomatoes, homemade tzatziki, roughly chopped Boston lettuce, and thinly sliced onions. Placed all inside of a wrap, it was like my own little Doner Kebab-esque stand! Now that we have officially moved to the Poconos I am trying to use the grill as much as possible. The simple pleasure of grilling has been missing from my life for nearly three years, so I am doing my best to make up for lost time. As with most of our cooking, we weren’t exactly sure what we were going to have for dinner. Once we were inside the local grocery store it was hard to miss the big sign touting their Memorial Day sales. Near the top of the list? $4.99/lb fresh lobster. Yes please, we’ll take two. The first lobster, a good-sized male, weighed in at about 2.2 lbs. 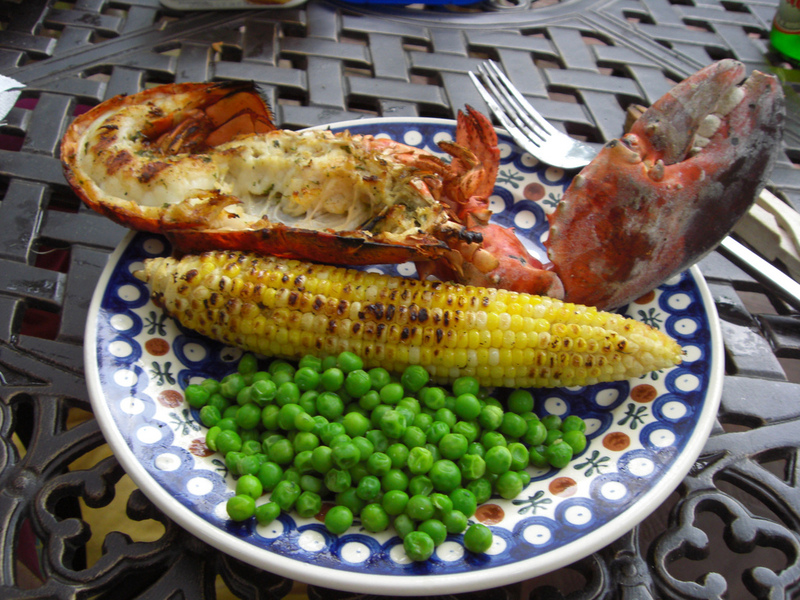 The second lobster, a female since she had the red roe sacks, was about 1.5lbs. As an animal lover, I’ve always had some issue with the boiling process. I have learned a technique that makes me feel a bit better though: Put the lobsters in the freezer for 10-15 minutes before dropping them in the pot. After cooking for about 8 minutes I pulled them out, split them in half, cleaned out the innards, and put them on a plate. 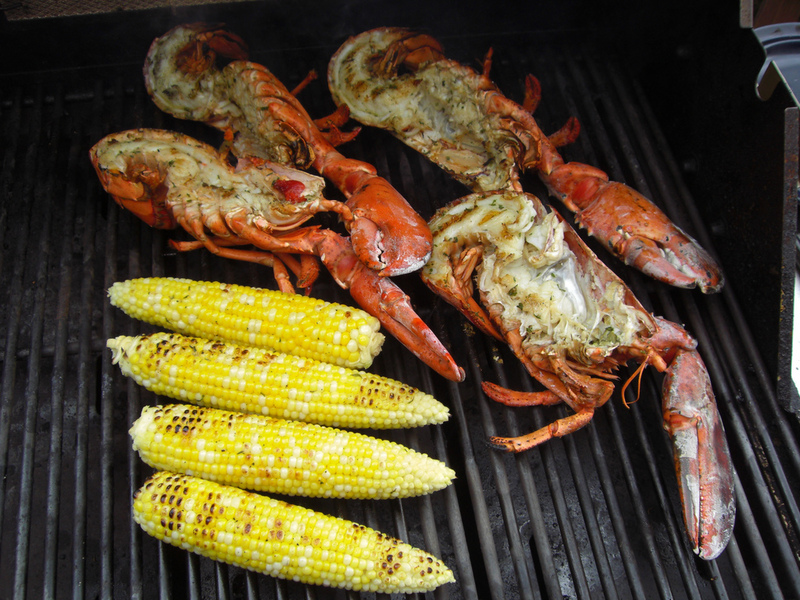 I mixed all of those together and brushed them on the inside of the lobsters. Over a medium/hot grill I placed the lobsters meat-side down, and cooked for about 5-6 more minutes, flipping a few times to distribute the heat. 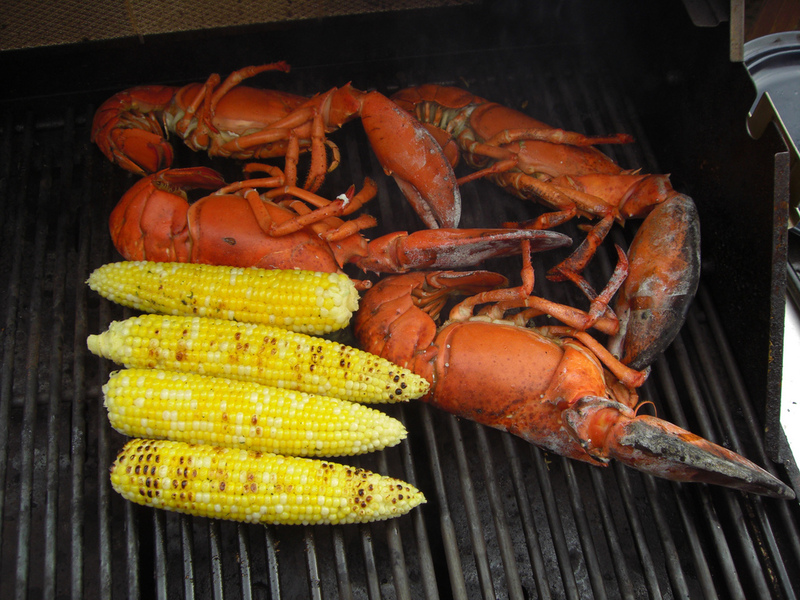 While I was cooking those, I added some partially boiled sweet corn to the grill. 10 minutes later it was time to eat! Delicious. And of course, as the title suggested, I washed all of it down with a nice 750mL bottle of Delirium Tremens. The weather had finally worked out and I could finally get outside and do some grilling. The weather in the Poconos at this time of the year can be fairly awful, so I was determined to take advantage of the mostly sunny weather in the mid 60’s. Our first night there we made lobster salad sandwiches and had some homemade coleslaw. We got a 2 lb lobster from the grocery store and I boiled it for about 6 minutes before splitting it in half and finishing it on the grill. Once it was thoroughly cooked I removed the meat and chopped it into bite-size pieces and let Brie work her magic with the dressing. Long story short: It was delicious! 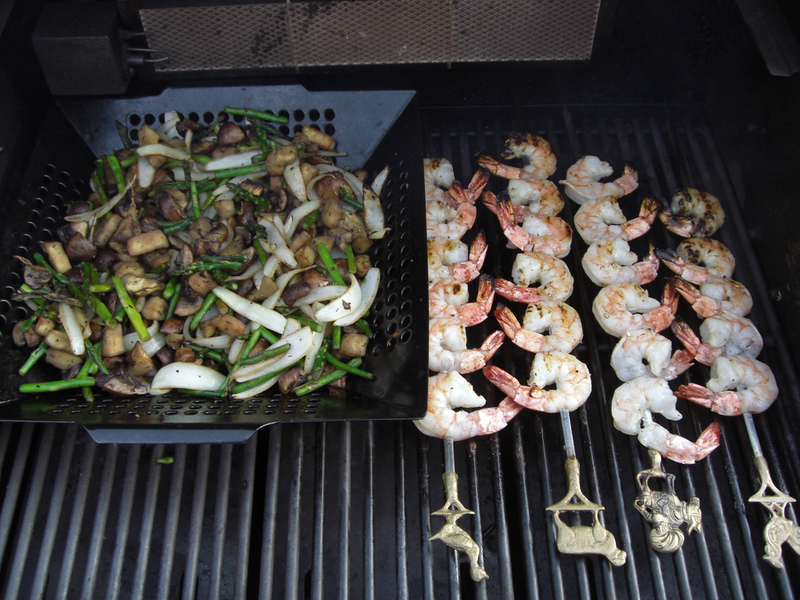 The second night featured grilled vegetables (asparagus, eggplant, onion, and mushrooms) and garlic-lemon marinated shrimp. 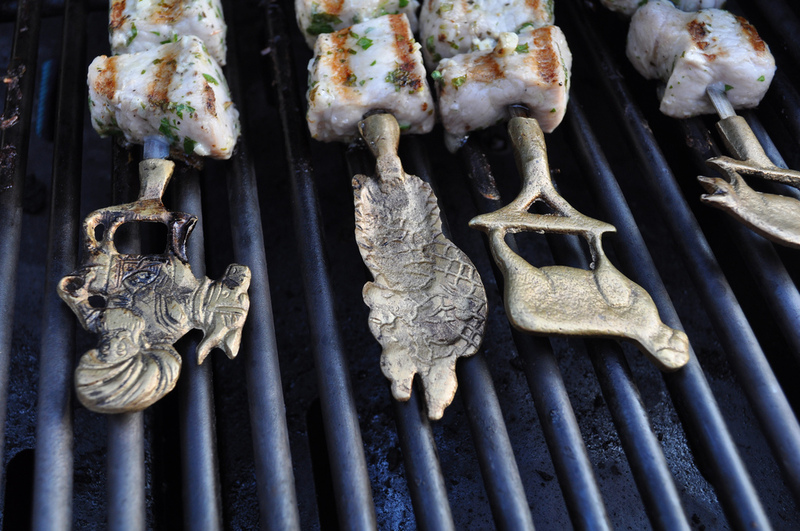 One of my favorite things to use are the awesome metal skewers that my parents brought back from Turkey. Each one has a different handle featuring a different animal or character. The only problem? They get incredibly hot and you have to make sure you have enough layers between them and your fingers. The vegetables were cooked perfectly and the non-stick grill basket is one of the coolest things I have used. The only issue was that the asparagus was so thin they occasionally worked their way through the holes in the basket! On the final day we had marinated london broil. For the marinade I used garlic, rosemary, cracked pepper, hot pepper flakes, and olive oil. After marinating for about 10 hours I shook off the big bits and put the meat on a hot grill and cooked them to medium-rare. 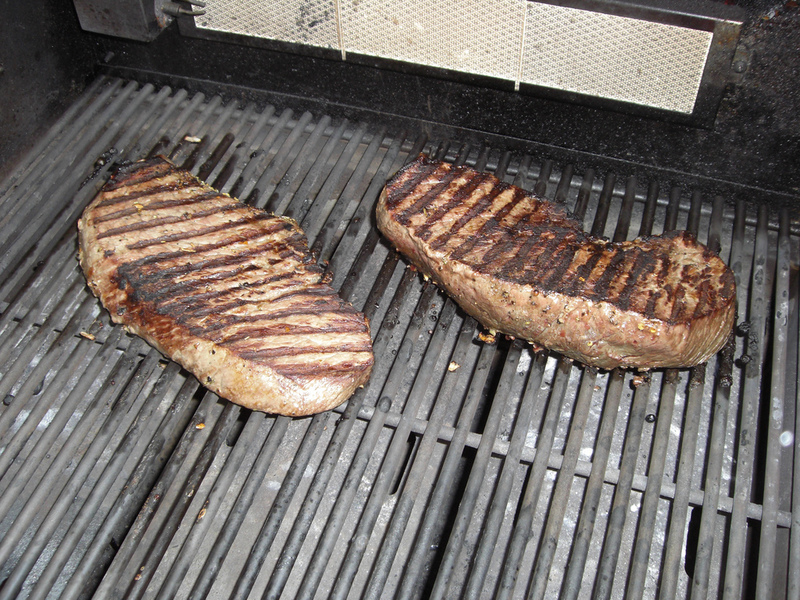 After they were done I let them sit for about 10 minutes before slicing them in thin strips across the grain. With this I served an appetizer of roasted golden beets with feta cheese, topped with a lovely vinagrette that Brie put together. For side dishes I made mashed sweet potatoes and steamed broccoli. As with all of our trips to the Poconos, the weekend wouldn’t be complete without a few encounters with some wildlife. This trip featured a very hungry red squirrel at the deer trough, and a black bear doing the same thing. Now that the weather is warming up my parents have vowed to stop feeding the wildlife in hopes of preventing the bears from hanging out permanently. 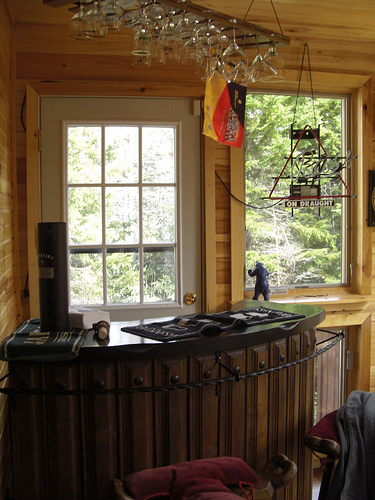 And finally, we moved the bar and stools from the basement up to the sun room. It looks fantastic! 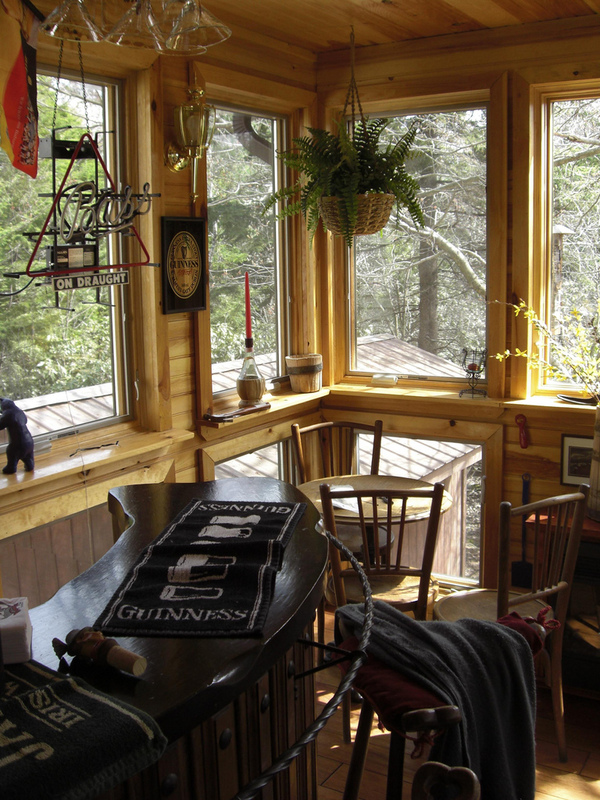 I look forward to many cocktail hours out there this summer.